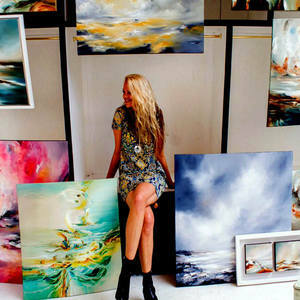 Alison's atmospheric oil paintings are vibrant and seductive and focal points for any space. By expressing the power of light playing amongst the water drops, this artist shows the abstract, surreal side to the natural world. Her seascapes follow a deep tradition which Johnson modernises and brings to a contemporary forefront. Colours sink below a piercing white surface as oceans and landscapes drift in and out of a sweeping hazy mist. The sky appears deep and brooding, the colours revealing a darkness that battles with the flashes of light. When shapes and figures do reveal themselves they appear lost and fragile against the infinite space of the world around. Such is the atmosphere contained in these works they could easily be viewed as pure abstractions, each detail vital enough to stand alone. Ephemeral, warm powerful and evocative she creates a sense of movement through colour, light and balance. Johnson's delicate handling of the world she depicts around her has the power to not only move the viewer but to make a lasting impression. With a nod to the impressionist painters Johnson's work has been likened to the great masters of our time such as Turner. Such high acclaim has guaranteed her many exhibitions within the UK, Italy and Paris and is soon to exhibit in the Middle East. Her work continues to reach clients on an international scale.